It is my purpose, as one who lived and acted in these days, to show how easily the tragedy of the Second World War could have been prevented; how the malice of the wicked was reinforced by the weakness of the virtuous; how the structure and habits of democratic states, unless they are welded together into larger organisms, lack those elements of persistence and conviction which can alone give security to humble masses; how, even in matters of self-preservation, no policy is pursued even for ten or fifteen years at a time. We shall see how the counsels of prudence and restraint may become the prime agents of mortal danger; how the middle course adopted from desires for safety and a quiet life may be found to lead direct to the bull’s-eye of disaster. We shall see how absolute is the need of a broad path of international action pursued by many states in common across the years, irrespective of the ebb and flow of national politics. It is my purpose, as one who has been active in the church, to show how easily the tragedy of the irrelevance of the church on modern culture could have been prevented; how the malice of the wicked was reinforced by the weakness of the virtuous; how the structure and habits of so-called tolerant churches, unless they are welded together in the uncompromising truth of the Bible’s Gospel of Jesus Christ, lack those elements of persistence and conviction which can alone give security to proud yet confused masses; how, even in matters of eternal self-preservation, no consistent theology is pursued for even a few years until replaced with the latest spiritual fad. We shall see how the counsels of prudence and restraint may become the prime agents of eternal immortal danger; how the middle course adopted from desires for safety and the quiet life may be found to lead directly to the bull’s eye of disaster. We shall see how absolute is the need of following the narrow path of Christ pursued by many churches in common across the years, irrespective of the ebb and flow of the popular, majority culture. Destructive, unredeemed conflict in the church usually is a result of some who are willing to compromise God’s clear plan and path for his church in total submission to Christ. Without virtuous church leaders and members willing to confront the schemes of the wicked, the malice of the wicked will be reinforced. Whenever we value tolerance over truth, lose persistence and conviction in the one Gospel of Christ, or seek merely safety and the quiet disengaged life, we run the risk and danger of becoming irrelevant. That may sound harsh but look at the reality of our culture today. Where do you see culture being informed and conformed to the image of Christ and his kingdom by the relevance of the church? Irish philosopher and politician Edmund Burke said nearly three hundred years ago, “All that is necessary for evil to triumph is for good men to do nothing.” That is as true in the church as it is other venues (just as is Churchill’s statement above concerning the malice of the wicked being reinforced by the weakness of the virtuous is likewise true). My prayer is that we will encourage our leaders to be both virtuous and strong by being so ourselves as we follow the King of Kings and the Lord of Lords as his virtuous strong. We hope that it is an encouragement and help to you as you seek to redeem your church or other organizational conflicts. There is so much wisdom in this brief book: The Heart of a Servant Leader: Letters from Jack Miller. The example I was reviewing today was written to a man who was in conflict with his church leaders and then, after another pastor was brought into the conflict to try to help (“Rob”), the man became conflicted with the new (trying-to-help-with-the-conflict) pastor too. “You were so concerned about yourself that you hardly seemed to see or think of them as people as well. That was pretty cold, was it not? … Please be in heart what you really are: a son of God and a brother to Rob. So love as a son, think as a son, see these painful events as an exposing of all of our sins together by the Spirit of sonship as part of revival in the church and its world mission of the mid-1980’s. See Rob in a new light. He is a brother authority introduced to you by Christ. Christ is at work in him and through him; the King is on the move! We easily forget the moving of the kingdom in situations of conflict and think secularly, carnally, and not spiritually about such matters. Christ is not abandoning us, but breaking us down together … You need to learn from Rob and to expect Rob to learn from you. Perhaps I felt the absence of this kingdom point of view in both of you as we talked and often wondered if either of you saw how serious was this vacuum of faith. Forgive me if I am wrong here. But was there a kind of frozen hopelessness in both of you? Am I wrong? Were either of you seeing the other with confident faith in Christ and His power to change? Or were you together looking at problems as though God and Christ did not exist or at least had no saving power? A. Trust God. Love People. To some who were confident of their own righteousness and looked down on everybody else, Jesus told this parable: Two men went up to the temple to pray, one a Pharisee and the other a tax collector. The Pharisee stood up and prayed about himself: ‘God, I thank you that I am not like all other men — robbers, evil doers, adulterers — or even like this tax collector. I fast twice a week and give a tenth of all I get.’ But the tax collector stood at a distance. He would not even look up to heaven, but beat his breast and said ‘God, have mercy on me, a sinner.’ I tell you that this man, rather than the other, went home justified before God. For everyone who exalts himself will be humbled, and he who humbles himself will be exalted. True humility trusts in God; its focus is on the Lord. In faith, we are called to give God our worries, fears, and doubts. We can trust that he is the Redeemer who will right every wrong in this life or in the life to come—for every wrong has either already been paid for at the cross, or will be paid for in hell. Therefore, we can turn away from any spiritual adultery related to vengeance and prize Jesus above even our own vindication! We can trust in that which is unseen more than in that which is seen (Hebrews 11:1). We can determine what would please and honor God and then do it. Trusting God is our only truly safe haven. To trust in God is to grow in spiritual maturity. When we trust God, we pray. When we trust God, we stop valuing the things that the world values (comfort, success, recognition, fame) and we begin to value the things that Jesus values (sacrifice, service, humility, love). We start to view ourselves as the “chief of all sinners” and we throw ourselves at the feet of Jesus and wash his feet with our tears. Our weeping comes, but we have the hope of joy in the morning. When we are living by humble trust in God, we overflow with love for our neighbor and our enemy. Then, when we see our fellow brothers and sisters also trusting God, we can begin to trust each other again as well. Trusting God, especially while we are in the midst of conflict, is indispensable to redeeming church conflict because it opens to us the reality of again being able to trust others. I heard from a friend this week (after she had made an apology to a pastor and asked his forgiveness) that the pastor was gracious, forgiving, and VERY surprised/grateful. He had served in ministry for over twenty years and she was the FIRST PERSON to ever apologize to him. I believe her–but it breaks my heart. Surely this man had been sinned against at some point. Surely at some point, he was misunderstood, misjudged, treated uncharitably. How could it be that NO Christian had ever apologized to him? Oh, friends! It is SO sweet to experience the JOY of genuine, Christ-centered, Christ-exalting reconciliation. My friend and her pastor experienced it this week. I have experienced it time and time again when people have lavishly forgiven me. How I pray that we would ALL begin to confess and forgive to one another—that the world might see that the Father sent the Son and the Father loves them (John 17:20-23!). Not only is this an extraordinarily important topic because of our duty to protect our children to the best of our abilities, it is also one of the “most prone to destroy/divide a church” topics. Oh. And if you think that your church doesn’t have men and boys (and increasingly women) habitually viewing p*rn and reading er*tica? If you think “that will never happen in MY church!” If you don’t think that abusers intentionally prey on churches? Then truly: it is particularly important that you read this article. Q. How can church-going Christians truly build the “ties that bind” and cultivate “the unity of the Spirit through the bonds of peace?” through intimate, safe, authentic relationships that will persevere through conflict? These statements begin chapter 5 of the wonderful book I am presently reading: Eric Metaxas’ biography Bonhoeffer. They are taken from a journal entry that the 22 year-old German theologian, Bonhoeffer, wrote over eighty years ago. Yet, they provide a fit starting point for a reply to today’s question because they challenge us to think careful about two words: church and vanity. Have you ever felt alone in the church because you know your relationships there are in vain? Vanity denotes emptiness. Futility. Ineffectiveness. To be in vain is to be of no value. Trivial. Insignificant. Superfluous. One of the synonyms for vanity (“otiose”) actually suggests that when something is vain, it serves no purpose and is even an encumbrance. How often are your relationships in the church empty, hollow, lacking in real substance or soundness? Do your church relationships ever feel like an (encumbering) burden? Many Christians have told me that they had absolutely no hesitation leaving their churches when conflicts arose because they had no significant or meaningful ties to their churches. Prayer was superficial or absent. Most relationships were hassles rather than comforts. Worldly worth and achievement were valued more than bearing with fellow sinners who were broken in contrition. All of these descriptors are evidences of vanity in the church—and sadly, they all too often perfectly portray what we Christians mistakenly call fellowship. Jesus said, “For I have not come to call the righteous, but sinners” (Matthew 9:13b). Paul wrote quoting the Old Testament, “There is no one righteous, not even one” (Romans 3:10). In the parable of the Pharisee and the Tax Collector (Luke 18:9-14), our Lord makes it very clear that the one who prays in humbleness will be justified before God. First, we truly believe God’s Word that everyone is a mess. I am not OK and neither are you. I must believe that I sin because by nature I am a sinner. You, too, must believe the same about yourself and about me and everyone else you know. Third, together, we practice prayer that demonstrates humble dependence on God and not on our effort, wealth, or worldly standing. This is prayer that will be used by God to overcome our loneliness and knit us together in genuine love and friendship. And fourth (and preachers please hear this clearly), we encourage (dare I say demand? ), preaching that takes the Gospel to the specific challenges we messy people face every day. We build and cultivate real relationships in the body of Christ when we live every moment with a Gospel mentality that directs our prayers and our desires to value Christ (and what He values) above all else. Of course, this is also how the people in a conflicted church will redeem their conflicts for God’s glory by persevering against the temptation to merely flee. They will stay because they know that to do otherwise would be to abandon their beloved friends. Tara here … Just wanted to add a note that I’m the reason “otiose” is in the title. I love learning new words! And I thought some of our verbivore friends might enjoy it too. Tara often does Q&A’s at her events and one question she hears a lot is: How can I help a person see and confess their sin that has become a barrier to our relationship? In a previous blog, I responded to one aspect of that question: the problem of spiritual blindness. But that is only part of the response that should be considered. Unrecognized sin that has become a barrier to a person’s relationships in the church is a major contributor to wider church conflicts. While spiritual blindness does trap a Christian into thinking they have no sin that needs to be faced, there are other factors that we should consider. As always, Dr. Powlison’s counsel is based in Scripture. “Speak the truth in love” is the message of Ephesians 4:15, 4:25, and 4:29. And 2 Timothy 2:24-26 encourages us to love people by demonstrating mercy and care even as we confront them with the sin that has taken them captive. I find it reassuring to know from the counsel of one of the church’s most godly and respected biblical counselors that the loving thing to do is to bring to a sin-captured friend the truth of sin’s effect on their life and in relationships. The podcast interview concludes with the observation that even if the person continues on their path of destructive sin they will remember your mercy and care. Ultimately, God will use the way you spoke to your friend at some point to change that person. What if my friend, a self-professing Christian, cannot discern spiritual blindness due to something else? That is, what if they are (despite their Christian profession) actually unregenerate and unable to spiritually discern sin? “The man without the Spirit does not accept the things that come from the Spirit of God, for they are foolishness to him, and he cannot understand them, because they are spiritually discerned” (emphasis added). Even in the context of mercy; even if my friend knows that I love, like, and care for them; even if they may agree their behaviors are self-destructive, the fact remains, according to Scripture, that my friend will not discern their behavior as sin because sin is something spiritually discerned. Sadly, unbelievers on the membership rolls of every church are the norm rather than the exception. The church is a mixture of true believers and those who may think they are believers but actually are hypocrites. (See the frightening words of this reality at Matthew 7:21-23.) These are the friends needing our greatest care, mercy, and love … they need the Gospel for the first time! Repeated denial of ones sins is clear evidence of unbelief going beyond spiritual blindness. We would expect a true believer to actually “see” their sins when mercifully confronted about them by a friend and to repent and do everything possible to change. That is clear evidence of belief and faith. Repentance and confession is the norm for a Christian. Everyday life in the kingdom is reflected by one simple character trait: humility. I have been in too many churches where conflicts go on and on because there is no repentance, no confession, and no humility. I fear at the heart of those conflicts there are people who are unregenerate but who think they are Christians. “The average Christian defines sin by talking about behavior. Beneath the battle for behavior is another, more fundamental battle — the battle for the thoughts and motives of the heart. Everything we do is shaped and controlled by what our hearts desire. As much as we are affected by our broken world and the sins of others against us, our greatest problem is the sin that resides in our hearts. That is why the message of the gospel is that God transforms our lives by transforming our hearts. Lasting change always comes through the heart. This is one of Scriptures most thoroughly developed themes, but many of us have missed its profound implications” (pages 14-15). “Why do you call me, ‘Lord, Lord,’ and do not do what I say? I will show you what he is like who comes to me and hears my words and puts them into practice. He is like a man building a house, who dug down deep and laid the foundation on rock. When a flood came, the torrent struck that house but could not shake it, because it was well built. But the one who hears my words and does not put them into practice is like a man who built a house on the ground without a foundation. The moment the torrent struck that house, it collapsed and its destruction was complete” (Luke 6:46-49). 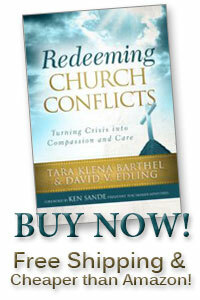 Church conflicts are like floods. Will your house, your church, stand or fall in the torrent? Does the foundation of true belief reside in every member’s heart? You will certainly know as soon as the flood of conflict hits.